Not So Happy Valley Campers-Green Party Links to the "Urewera 17"
No doubt members of the "Urewera 17" are extremely relieved not to be facing terrorism charges. Not far behind in the relief stakes would come senior members of the Green Party. If members of the "Urewera 17" were tried and convicted terrorism charges, I believe the fallout would destroy the Greens as a force in New Zealand politics. The Green Party is linked with members of the "Urewera 17" in several ways, both direct and indirect. Could this be why some Green Party MPs have played a leading role in the "free the terrorists" campaign? One of the most obvious Green Party/"Urewera 17" links is the Save Happy Valley Campaign. Green Party members have supported SHVC from both inside and outside the organisation since day one. Several Green Party members such as Alan Liefting, Tara Forde (a Young Greens leader), Mojo Mathers have been spokesmen for SHVC. Frances Martin has been both a leading Canterbury University Green Party activist and Happy Valley occupation co-ordinator. According to the SHVC website , on 14th March 2006 "Twenty-two members of the Green Party, of various ages, walked into Happy Valley for the weekend to show their support to members of the indefinite occupation. Green Party members tramped into the valley with packs laden with fresh fruit, vegetables, first aid supplies, and tarpaulins for the current occupiers, and cooked them dinner to show their appreciation for the courageous effort being made to protect this pristine New Zealand eco-system. The Save Happy Valley Coalition is grateful for the support shown by members of the Green Party and is pleased to be able to share interest and concern, as well as a decent meal, with members of the party." The Green group included Aoraki policy networker Felix Collins, Party Development co-ordinator (now co-leader) Russel Norman, Aoraki Executive Networker Natalie Cutler-Welsh and 2005 election candidates Mojo Mathers and Alan Liefting. Top left Green Party member Rik Tindall (now a Canterbury Regional Councillor) top centre Green Party co-leader Russel Norman, middle row right, wearing Green Part T shirt, leading Canterbury Green Christine Dann, middle row, second from rigt Allan Liefting. Russel Norman led the charge earlier this year when it was dicovered that a private security firm had infiltrated a spy into thex SHVC. Several Green MPs have spoken at SHVC functions, including party co-leader, Jeanette Fitzsimons and Nandor Tanczos. According to Green Achievements in Parliament 2007 Both Metiria (Turei)and Russel (Norman)tramp to the Happy Valley protest site in early 2007 as part of the Greens’ ongoing support of the Save Happy Valley campaign. While the Green Party provides support to SHVC, the backbone of the organisation is anarchist. SHVC's Wellington HQ is the infamous 128 Abel Smith Street, also home of the Wildcat Anarchist Collective, the Zapatista Support Group, the film project Kotahi te Ao and the anarchist website, Indymedia. At least five members of the "Urewera 17" have links with both 128 Abel Smith Street and the Save Happy Valley Campaign. Every one of them faces firearms charges. All five of them, except Tim/Ira Bailey would have faced trial for terrorism offences had not the Solicitor General refused the police permission to lay charges. The five include include Emily Bailey and her younger brother Tim/Ira Bailey, who was SHVC's campaign's spokesman for much of 2006. Photo removed for legal reasons. The others include two of the three members of the Indymedia editorial collective, Omar Hamed "Smush", a 23 year old Swiss national who cannot yet be named for legal reasons. The third member of the Indymedia editorial collective, well known anarchist Asher Goldman is also a leading SHVC activist and "Urewera 17" support campaigner. 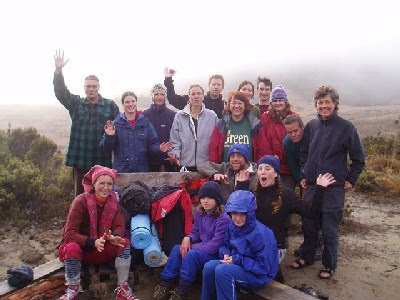 I have good grounds to believe that the Bailey siblings and "Smush" were involved in training SHVC activists at a secret training camp in the upper South Island, late in 2006. Certainly the police are aware of connections between SHVC and the "Urewera 17". When the "anti terror" raids occurred on October 15th, police also tried to search two Christchurch houses including one occupied by SHVC spokeswoman Frances Mountier, but were denied entry because they had no warrant. The police claimed they were looking for a "person of interest." The Save Happy Valley Coalition was at Parliament, complete with Great Spotted Kiwi, to talk with MPs about the destruction of the kiwi habitat in Happy Valley. State-owned Solid Energy plans to create a vast open cast coal mine in Waimangaroa Valley, one of the few stable habitats of the endangered Great Spotted Kiwi. Photo removed by request of Valerie Morse's lawyer. Note the blonde woman on the left, holding the banner Fitzsimons, Tanczos and turia?. Could it be "Uruwera 17" member, Valerie Morse? Looks like Val Morse to me. So at least five possible "terrorists" have been working within a Green Party supported organisation in very recent times. If they were convicted and the Green connections came out in court, what would that do to the Green Party's "caring and sharing" image? What would it do to Labour's chances of re-election in 2008 if their largest potential coalition partner was exposed as supporting a "terrorist" infiltrated organisation? Who thinks that the Green Party/"Urewera 17" links merit a little MSM attention? Trev, you haven't replied to my offer to supply information on myself at a reasonable price. I think you're demonstrating some serious socialist leanings with your preference for cutting and pasting from IndyMedia rather than buying quality information in a free market. I also notice some dangerous anarchist leanings in your rejection of the Laws of New Zealand, specifically your willingness to publish photos of particular people when you know full well that such publication puts you in contempt of court. However, I'm not sure that contempt charges would hold up for publishing photos of people who aren't actually the people you say they are (which is getting to be a bit of a habit of yours lately - perhaps you need new glasses, or are you boycotting the state subsidised medical industry? ), so maybe you have a defence. Which ones have I got wrong Sam? Contempt of court would apply to which pictures? Once again you want something for nothing. You'll be down at the WINZ office next. think its fair to say this makes u "fair game" A trev? Sam-you tell me what you've got and I'll make an offer-let's deal! Anon-sheesh, I'd have thought I was "fair game" long before now. An excellent and well sourced article. The linkage between the NZ Greens and the terrorists in Germany in the 1960-1970 (Baader-Meinhof Gang/Red Army Faction) is well known. At the end the conceit of the Left ensures the end justifies the means. I have often blogged on these blood soaked linkages - it is a pity it took real terrorist plans to brutally confirm it in NZ. Sam is right. You've mislabeled. "Contempt of court would apply to which pictures?" At least one of the 17 has photo suppression, so look into that. Odd I know. Trev, guess the penny hasn't dropped that the new anti-terrorist legislation can easily be used to shut people down such as yourself. You don't seem to be aware of statements from your glorious leader rodney in the house last week. I'm no friend of the TSA quiet. Rodney and heather were right to vote against it. As Steven Franks has said, if we'd kept the old sedition laws, this latest debacle wouldn't have occurred. OK Trev, I'll tell you which of your material is in contempt, which is mis-labelled and supply corrections to the material you've published about me, plus background material on myself. Your offer? Trevor, your analysis is way off the mark. You are trying to discredit individuals and organisations because of indirect links or links because they believe in the objective. The Green Party support the aims of SHVC because both organisations want to work to improve the environment. The Green Party support the aims of SHVC but that does not mean that they agree with all of the methods used. Your completely wrong to state that "the backbone of the organisation is anarchist." Yes, there are anarchists who support the campaign but that does not mean the campaign is run by anarchists. SHVC is an extremely democratic and open organisation with no hierarchy which makes it difficult for a cabal to wrest power from the group as a whole. Support for SHVC comes from a wide demographic including Forest and Bird members, students, miners, academics, foreign tourists and "ordinary" people. As a libertarian I would have thought you would be against some of the police raids where police had no search warrants and seem to treat everyone as guilty until proven innocent rather than innocent until proven guilty. One of your comments is also bordering on being libellous. Trying to save a cherished landscape from ruin is not terrorisam.Flying planes into buildings and attempting to turn the entire planet into a'' private''for profit venture is terrorisam.In fact the latter is worse,at least the terrorists have goals other than the accumilation of private profit. Individual sucsess is not a liscence to deprive the less sucsessfull of what belongs to all of us.Who among us created this planet that we all must share? Who is responsible for making the sun come up in the morning? Each and every person born upon this earth has a right to be here,take what they need to live in a substainable manner from nature and live freely without harming others. The fact that someone is willing to work hard does not give them the right to destroy the planet! History is full of hardworking criminals! The author of this website seems to have a problem with the morality of the collective,or collectivisam.The entire planet is a collective,meaning it is shared by many different species and it is the interaction of these species that make life possible for individual organisams.Think about it,you came from a collective,unless you were born of a virgin!Life is a collective! This is what it boils down to.This world is our home,not a market place.We can either live here collectivly and cooperate in order to make it a better place or we can treat the planet like a commodity,compete with one another to get ahead and live in a constant state of strife and struggle.This is our choice.Personaly I like freedom,and freedom is not possible if life is a struggle to accumalate wealth and keep it.freedom is only possible when we are in a state of peace,not being forced to compete or fight for survival or what is needed to survive.This state of peace will only come when we understand that life is a gift''you did not purchase the right to live''and that the resources needed to live are gifts also.Again who among us created this world? Ask yourself why if life is a gift, why is it that we must compete with one another for the means to live,and why should anyone make a private profit from or off of the needs of others,particularly when it is nature that supplies those needs? As an end note do some research on the topic of the original enclosure movements and the orgin of private property.This is a topic that I wish everyone would become familiar with.